A: This paper focuses on the issue of regional inequality. It moves away from focusing on the relationship between factor accumulation and regional inequality, and pays more attention to the ways in which regional inequality has articulated with factor productivity. 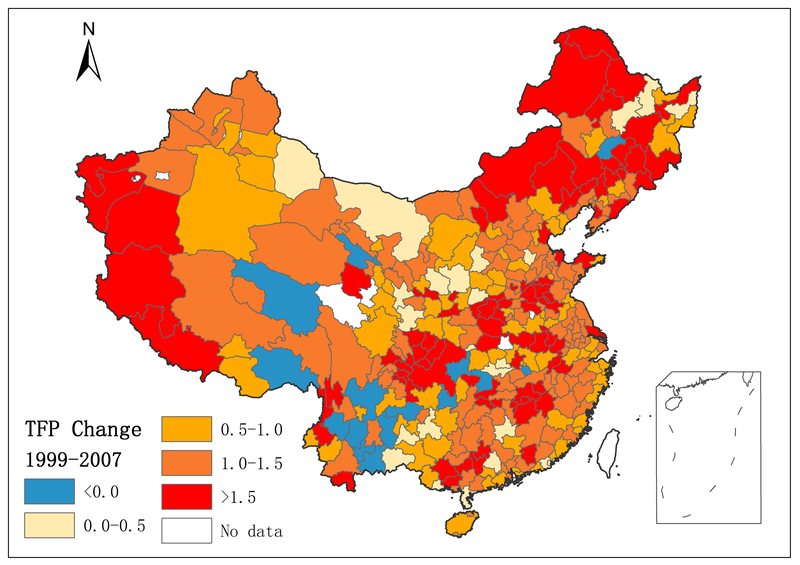 It does so by using a large firm-level dataset on China’s manufacturing industry to measure and examine regional inequality of factor productivity in China at various geographical scales. In addition, we decompose the dynamics of regional inequality of productivity, and investigate its relationship with institutional context and firm dynamics. A: Empirically, this research seeks to find brighter future for countries like China with a high level of regional inequality that may trigger political, social and even security problems, by pointing out that marketization and globalization may enable regions to push forward economic growth while government intervention could be counterproductive. The policy implication is of central importance for developing countries that are facing the socalled “middle income trap” as productivity growth is one potential way to transcend this trap. We also show that institutional factors have long-lasting consequences on regional inequality of productivity by using both a decomposition method and regression analysis. A: Existing literature tends to focuses on region’s different factor conditions, the quantity and quality of input factors (e.g. capital, labor, technology, and infrastructure), and their contribution to regional inequality, while few studies have pointed out the importance of factor productivity as a driving force of regional inequality. This paper contributes to the literature on the causes of regional inequality by paying special attention to factor productivity— the effectiveness with which accumulated factors of production, or capital, are used to produce output—rather than factor accumulation. It does so by disclosing how factor productivity is not only interconnected with firm dynamics (technological and organizational change of existing firms, firm entry and exit) but also shaped by institutional context. A: We show that the degree of regional inequality of productivity in China has been declining as relatively less developed central and western China have been catching up with China’s wealthy coastal regions. Furthermore, our decomposition method shows that China’s regional productivity growth has been largely driven by productivity improvement of existing firms and entrance of firms with high productivity during 1999-2007. Finally, China’s peculiar institutional context has had some fundamental influence over productivity growth and regional inequality of productivity. A: While explaining regional inequality, existing empirical studies tend to focus on the quantity and quality of region’s input factors (e.g. capital, labor, technology, and infrastructure), whereas insufficient attention has been paid to how efficiently factor accumulation (input) has been translated into economic development and income increase (output)—i.e. factor productivity. Low productivity and slow productivity growth, as opposed to impediments to factor accumulation, may be the key to understanding why certain regions face low income and stagnant economic development relative to others and why certain less developed regions fail or manage to catch up. We also point out that, on the one hand, firm dynamics play a crucial role in region’s productivity change through a process of reallocation of input factors from low-productivity firms to high-productivity firms, and further contribute to regional inequalities. On the other hand, another issue that has received much attention in the public debate as well as in the academic literature is the role of institutional context in regional inequalities, which should not be underestimated particularly in transitional economies. A: The level, causes and development of income inequalities in both developing and developed countries have received considerable, interdisciplinary attention, resulting in an extensive literature emerging in recent years that have sought to measure inequality and examine its evolution over time. The spatial dimension of inequality has also attracted interests from policy makers and governments, since regional disparities in economic activities, incomes and other economic indicators boost overall income inequality. This research adopts a complicated view as it envisages regional inequality as contingent not only on geographical scales, spatial division of labor and the developmental stages of the economy, but also on a variety of factors, such as institutional contexts, region’s integration into the global economy and firm dynamics. Therefore, geography should be seen as interconnected with many social, economic, institutional and political factors, and thus should be analyzed in a more relational perspective.